Dear big box store: please make up your mind. 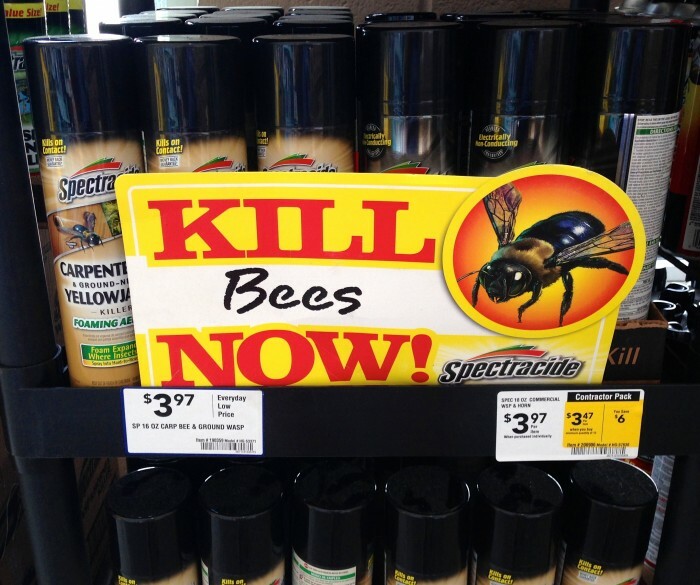 Yes, sometimes folks want or need to kill bees, wasps, etc. But given the current hullabaloo, this particular sales display was too ironic for words. 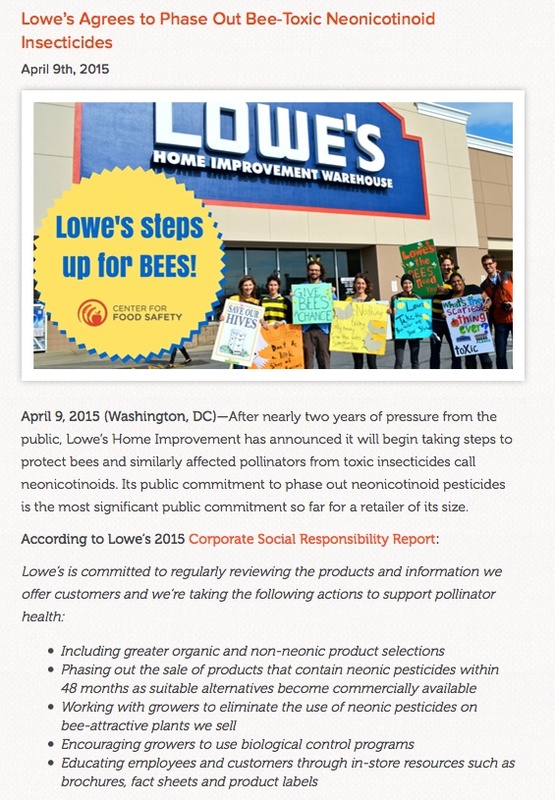 Posted on January 31, 2016 January 31, 2016 Author Holly ScogginsCategories Amusing Facts, Holly ScogginsTags pesticides, pollinatorsLeave a comment on Dear big box store: please make up your mind. Is a tomato a fruit? Or a vegetable? Yes. And yes. 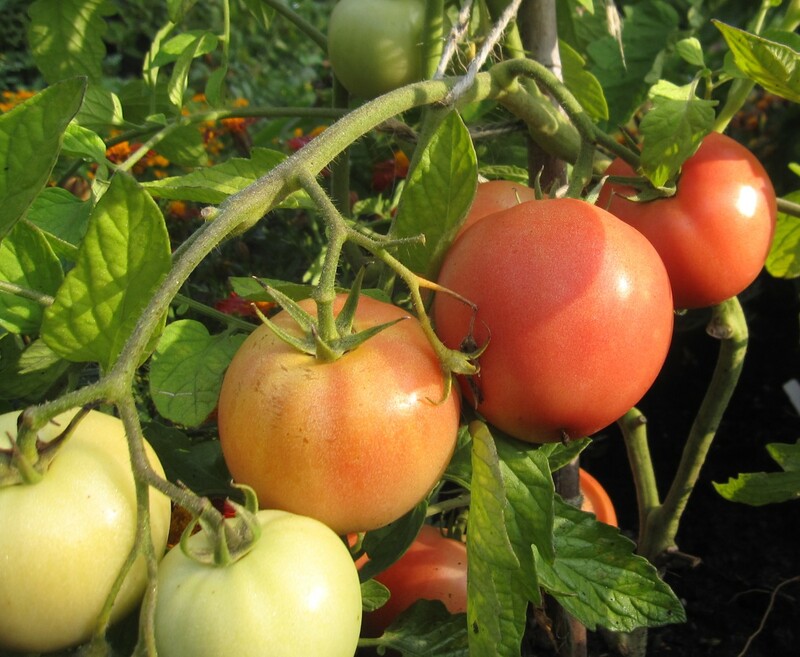 I’m not sure why this is the question that just won’t die, but I got it again at a event where I was speaking recently, so I am hereby going to issue the final, official, definitive ruling on the age-old question: Is a tomato is a fruit or a vegetable? Fruit. And Vegetable. At the same time. That’s right, folks. Vegetable and fruit are not mutually exclusive categories! Fruit is a technical, botanical term like leaf and petiole and petal which refers to a specific part of a plant. 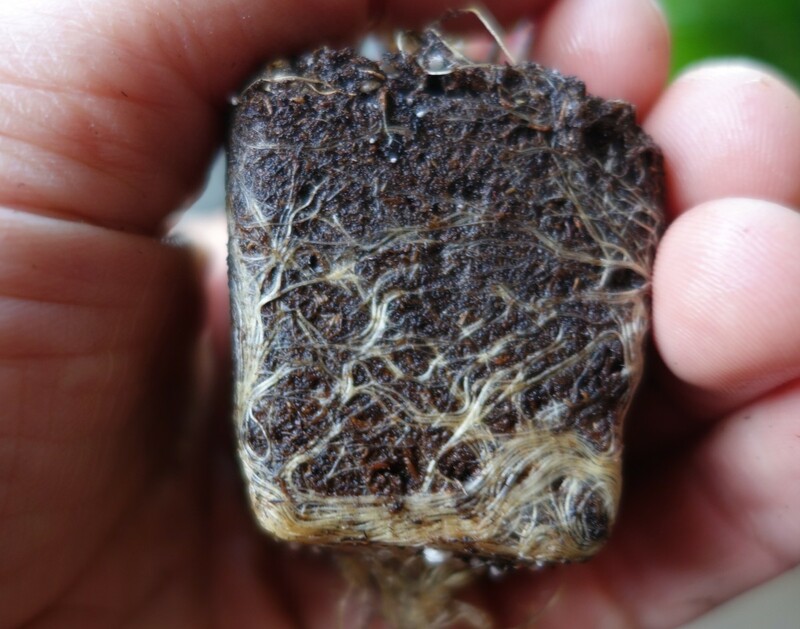 Vegetable is a cultural term referring to parts of plants that we eat. 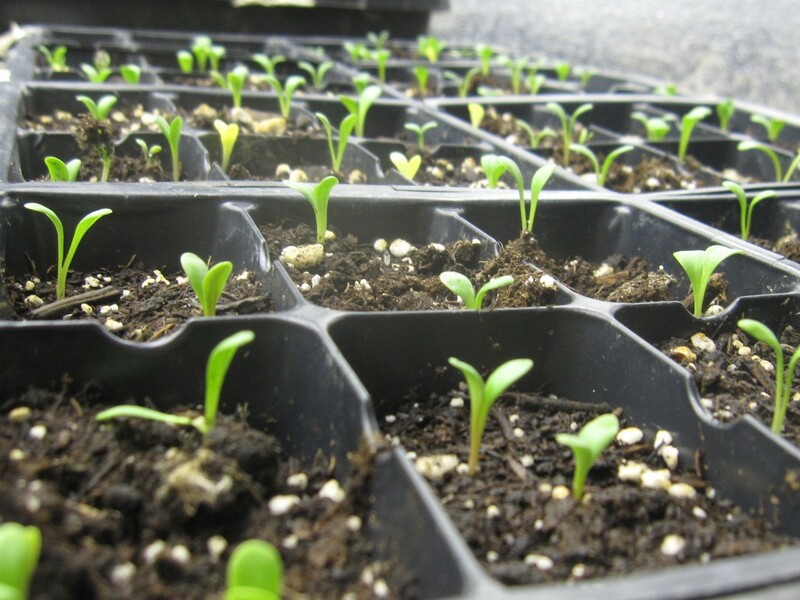 In other words: lettuce is a leaf and a vegetable, celery is a petiole and a vegetable, broccoli is a flower bud and a vegetable, and a tomato is a fruit and a vegetable. The real mystery to me is why this question always comes up around tomatoes and only tomatoes, when there are lots of other vegetable-fruits in the grocery store. Peppers, zucchini, pumpkins, eggplants, and cucumbers are ALL fruit. And vegetables. But somehow no one seems to wonder about them. Posted on January 26, 2016 Author Linda Chalker-ScottCategories Uncategorized5 Comments on Is a tomato a fruit? Or a vegetable? Yes. And yes. We are now headed into the dark part of the year. The winter solstice is less than a month away. For the moment, however, let us think not about these short days and long nights, but back to the summer—and especially to summer’s brilliant flowers. How do all these colors come to be? What allows us to perceive them? Why don’t we see the world in the black-and-white of old-style photographs? Let’s start our exploration of these questions in the northwestern corner of Washington’s Puget Sound, a stone’s throw from the Canadian border. Here lie the San Juan Islands, hundreds of islands, islets, and projecting rocks so beautiful that people sometimes ride the ferry just to glimpse them from the deck, never even getting off to walk on land. These complex and convoluted landforms are home to thousands of birds and marine mammals, their shores are decorated with exotic-looking creatures bumping up on one another, and every bit of soil is covered with rich vegetation—stands of Douglas fir and cedar, a bright coastal fringe of madrones with their vivid red-orange bark and brilliant white blossoms, and grasses that turn golden with the advance of summer. In the spring the islands are carpeted with wildflowers, and none more richly than eleven-acre Yellow Island. 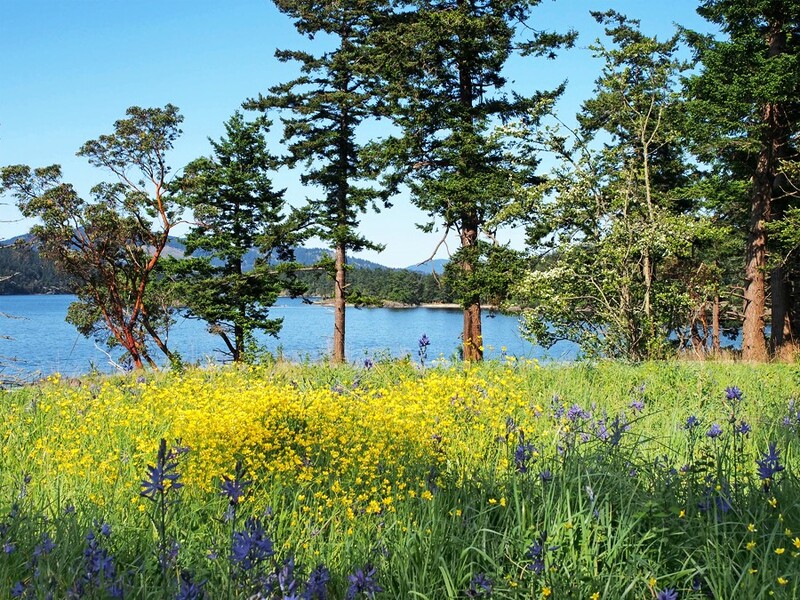 Yellow Island has been owned and protected by The Nature Conservancy since 1979. Its flora is basically intact, the way it once was on all the islands, and in the spring it is brilliant. The masses of yellow that give the island its name are buttercups. The photographer finds it hard to move forward, there are so many sights to delight the eye and invite a picture. The biologist is thrilled that such a place still exists, so close to the densely settled metropolis of Seattle and its surrounding cities. And I, in addition to these feelings, find myself marveling at the colors themselves. 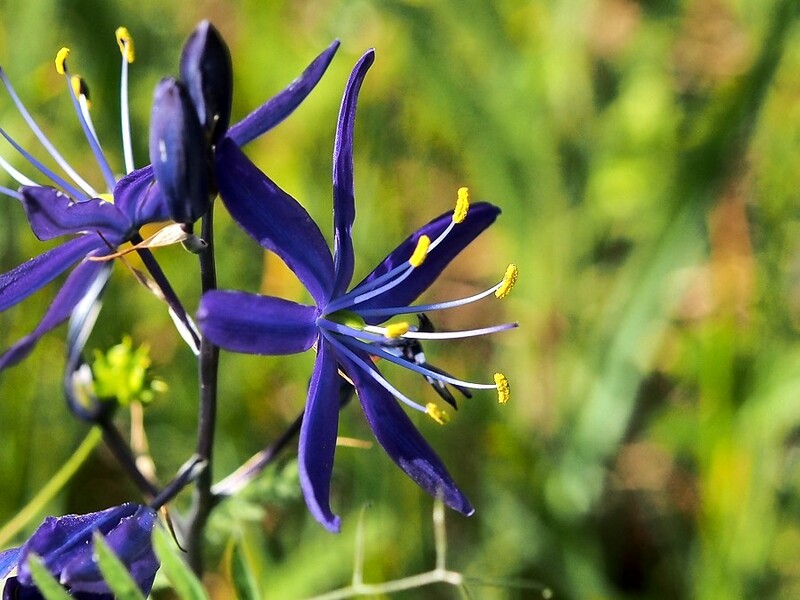 The purplish-blue camas lily, prized by Native Americans for its edible bulbs, abounds. 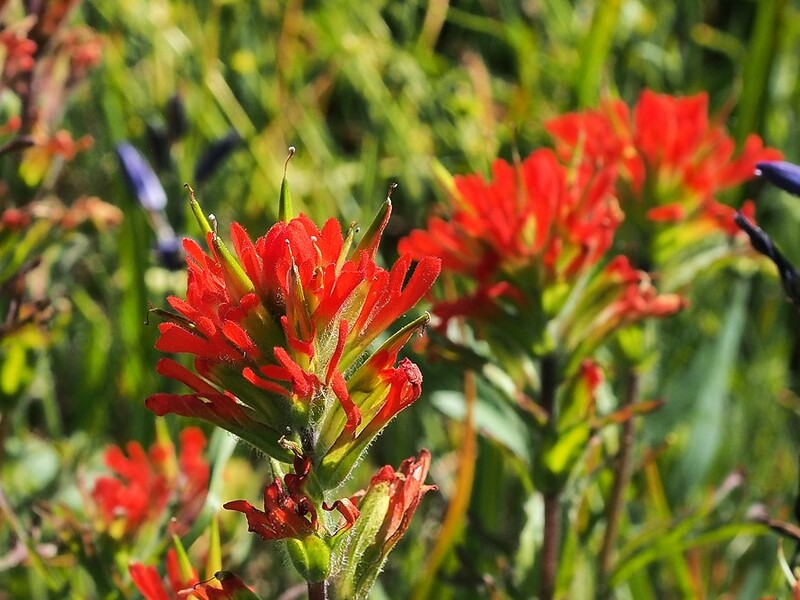 As does the brilliant red Indian paintbrush. The plants on Yellow Island glow with literally all the colors of the rainbow, from blue, through green and yellow, and on to orange and red. 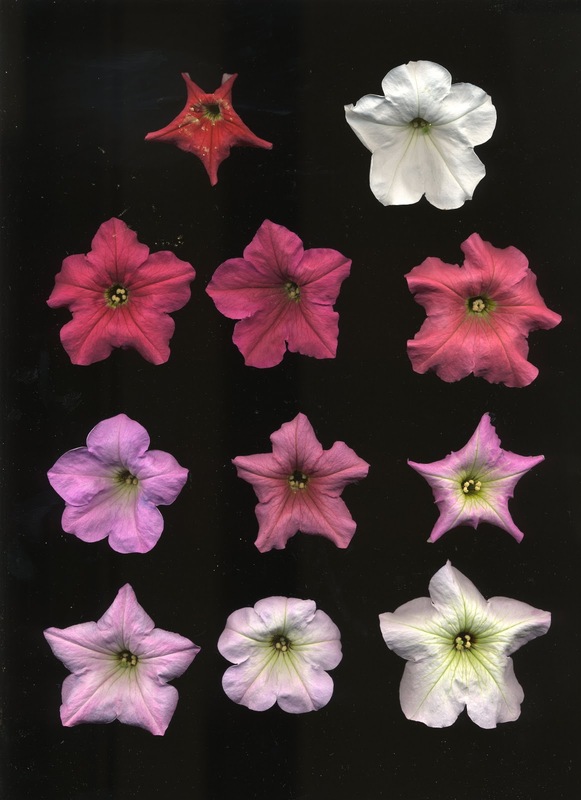 They call out a question that scientists and philosophers have asked literally for centuries—how do leaves and flowers come to have the colors they do? Indeed, why are objects of any kind seen by us as having distinguishable colors? The sensation of color is an everyday aspect of conscious experience for most of us, but what makes it so? It needn’t be, for we are all familiar with a world without color, as portrayed in the marvelously evocative black-and-white prints of master photographers. It is also different for those who have some form of colorblindness. For us to experience a colored world requires the operation of many mechanisms, not all of which are understood by today’s science. The foundation of the entire complex chain of processes leading to conscious experience is, however, the interaction of light with molecules. Inasmuch as there are two partners in this interaction—light, and the molecules that are affected by light—we will need to consider both of them. Let’s start with light, particularly sunlight, the natural light in whose presence all life on Earth evolved. Thermonuclear reactions occurring within the Sun emit massive amounts of energy that streams out in all directions, through the solar system and beyond. The total quantity of solar energy reaching the Earth is just right to warm the planet to a temperature that has enabled the evolution of life. It arrives on Earth’s surface in the form of a vast range of wavelengths of electromagnetic energy, from the extremely short-wavelength and highly energetic gamma rays and X-rays at one extreme, to the long- wavelength, low energy radio waves at the other. Between these two ends of the total electromagnetic spectrum the ratio of wavelengths (and hence also of energies) is 1018, or 1 followed by 18 zeros. Gamma rays are of atomic dimensions, so short that we have no sensory experience to compare them to, while radio waves are measured in miles. Nevertheless, their basic nature is the same. Extraordinary! Visible light is a tiny, tiny slice of wavelengths in the middle of this vast range, with ultraviolet (sunburn!) just to the shorter wavelength side, and infrared (heat!) to the longer wavelength side. 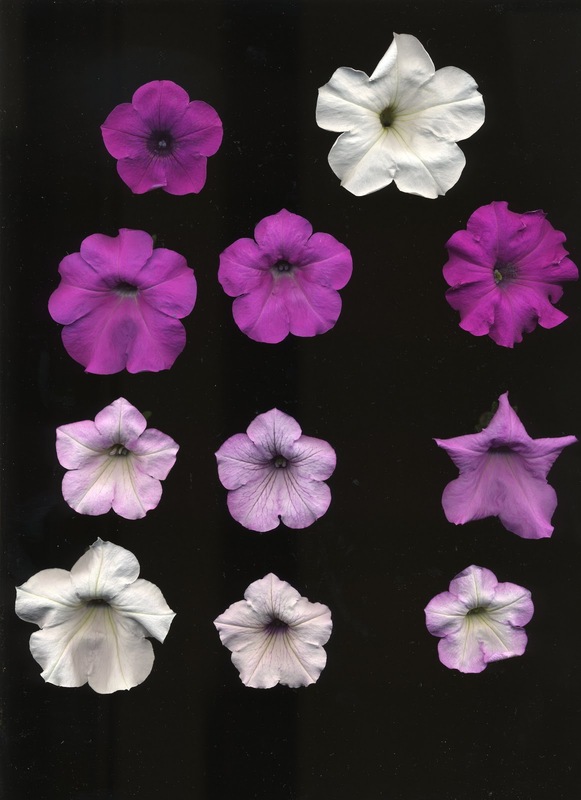 The spectrum that underlies our experience of light and of the visible world runs from violet to red. 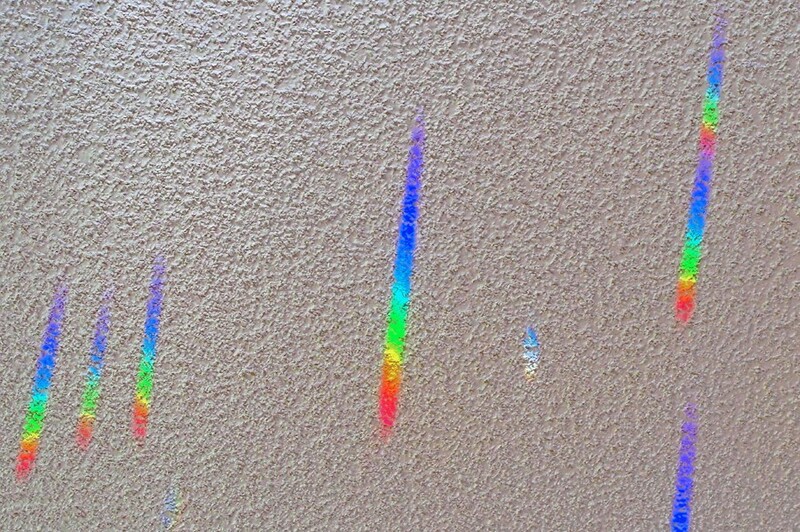 Here is what this spectrum looks like on the ceiling of a friend’s apartment, with the colors separated by a faceted glass ball she has hanging in her west-facing window. 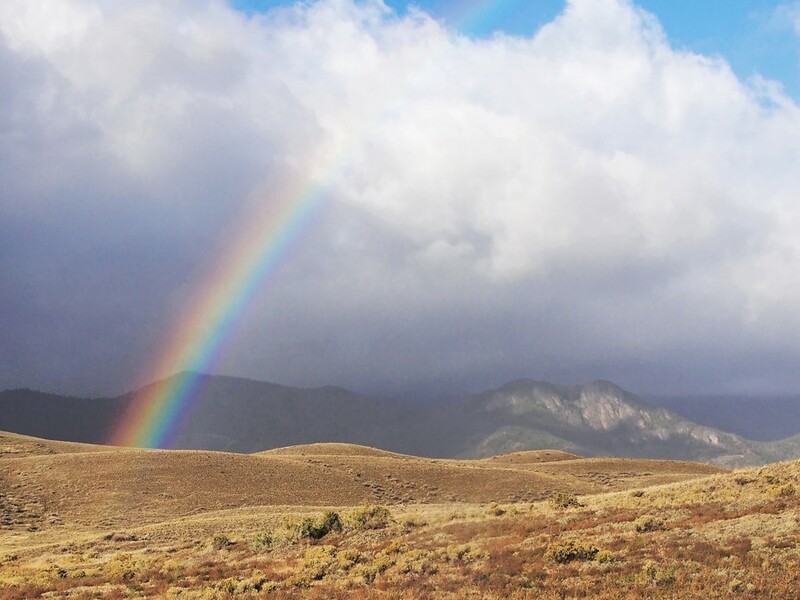 And here is the same spectrum seen in a rainbow over the rolling plains of Montana, north of Yellowstone National Park. The sunlight that reaches our Earth literally consists of all the colors of the rainbow. But what about the flowers? How do we relate the colors contained within the apparently colorless light that is shining on a meadow to the colors we experience as being the property of the buttercups, the camas, and the paintbrushes? To come to a deeper understanding, think about a colored liquid that you can handle easily yourself, say red food coloring. You grasp the tiny bottle, squeeze a few drops into a small glass of water, and voilà, you have red water. White light shining in from one side of the glass emerges as red light from the other side. Test it. If you let light shine through the glass and onto a sheet of white paper, you will see a patch of red. What happened to turn the white light that entered the glass into the red light that exited? When light struck the dye molecules that were dissolved in otherwise colorless water, some wavelengths of light were selectively absorbed. If they were absorbed, they could no longer pass through the solution and be seen on the other side. The color of the light exiting from the solution, therefore, is due to the wavelengths that were not absorbed. This is a bedrock principle that underlies our experience of color, and that we will explore in several subsequent posts. Molecules absorb some wavelengths of light and fail to absorb others, and the wavelengths that are not absorbed are ones that can reach our eyes and be seen. Notice that there are two partners dancing to manifest this principle, the light and the molecules absorbing the light. This partner dance will be our foundation as we explore the amazing realm of color. For now, just go out into the world and pay attention to the colors you see, being grateful for the privilege.